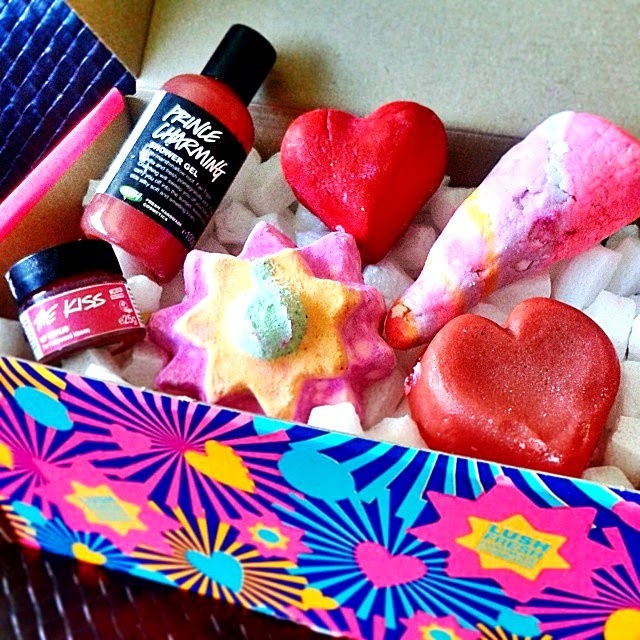 Review: Valentine's Day 2015 ideas with LUSH! Starting off with my favourites of course: the Cupid’s Love soap ($14.30/100g). This heart-shaped lightly shimmery soap gives off an invigorating fruity scent thanks to the fresh figs and passion fruit ingredients, before transitioning to notes of bergamot and rosewood. Apart from the luxurious scent, whilst fresh figs, passion fruit juice and soya yoghurt help to nourish skin and keep it soft and supple. 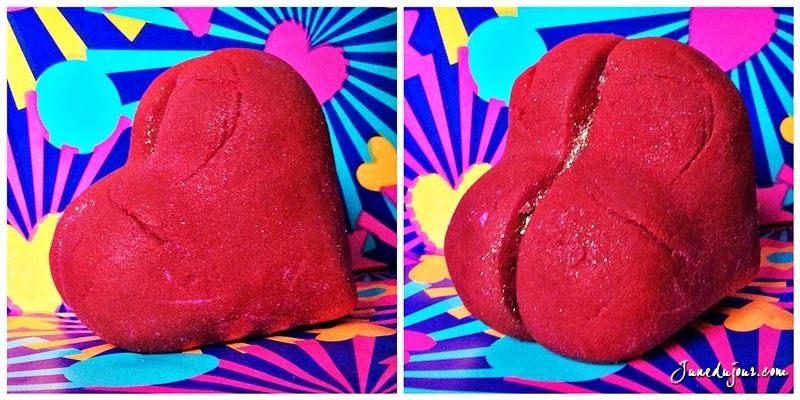 Something that looks almost good to eat is the Heart Throb bubbleroon ($19.00); does this not remind you of a giant red macaroon found in those French bakeries? , with beautiful essential oils and skin softening organic shea butter. If you were a fan of the LUSH’s African Paradise body conditioner (previously reviewed) like I am, you'll be happy to know that this bubbleroon shares the same fragrance! 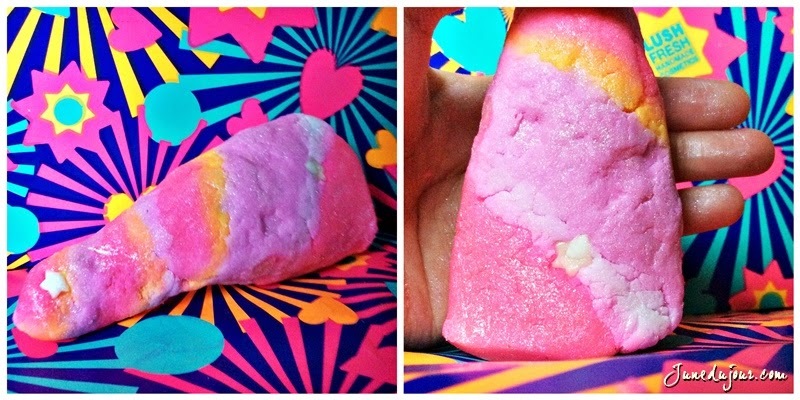 One of the new items to expect is the Unicorn Horn bubble bar ($11.00) each. As magical as it sounds and looks, its a delicate blend of lavender and neroli essential oils. Although its recommended to have it in a tub, I actually like pinching a small piece of to lather over body and admiring the magical shimmery consistency. Feels slightly softly gritty, I find this an excellent body scrub of sorts. And its such a pretty item to behold! The Prince Charming shower gel ($16.00 for 100g) is for the perennial girly-princess. Made of Marshmallow root and Fair Trade vanilla pod for a light sweet, musky fragrance. Its also contains nourishing almond oil, and cleansing, fresh pomegranate juice which acts as an astringent for a thorough cleanse. This new shower gel also contains warm fruity undertones of sandalwood, geranium and grapefruit essential oils. A tad too sweet for my liking though, as I'm more inclined to fresh scents. Forget the perishables like flowers and chocolate (...ok maybe Chocolate is acceptable)....gimme LUSH instead! The above review items are currently retailing at all LUSH outlets islandwide, so hope this post has perhaps given you some idea for your special someone. This sounds amazing. Can't wait to try it.